A huge so-called "peace diamond" sold by the government of Sierra Leone to discourage crime-tainted "blood diamonds" fetched $6.5 million on Monday. 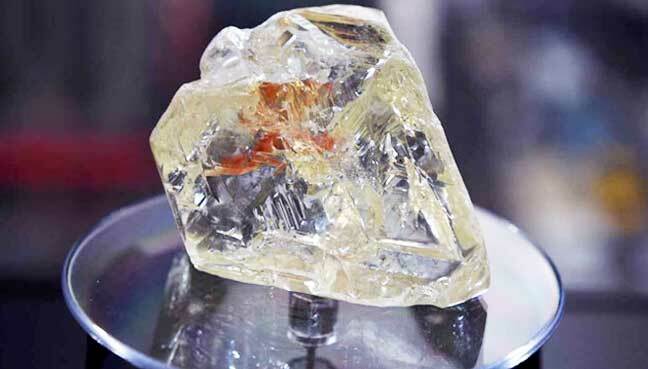 The 709-carat stone, which was unearthed in March, is the largest discovered in Sierra Leone in almost a half-century and is between the 10th and 15th largest ever found worldwide, experts say. Found by a company led by evangelical Pastor Momoh, the diamond was given to the government in the hopes it would handle the sale in a way that leaves more profits and development potential in Sierra Leone. British jewelers Laurence Graff purchased the stone, according to Martin Rapaport, whose group hosted the auction. The government was expecting about $7 million. "Perhaps we're dealing with the price of transparency," Rapaport said. Illegal mining and sales of so-called blood diamonds have been a major source of strife in many African countries including Sierra Leone. That was the goal of the auction approach of President Ernest Bai Koroma. Expectations at home were high, yet the price may have seemed a disappointment. Gibril Sesay, a market seller, said he wanted the government to provide "water, electricity and good roads for the people" with the proceeds of the gem following the sale. But Beatrice Cole, a civil servant, told AFP "the money paid for the diamond was far below what we expected" after watching the auction live on TV in Freetown.